Rob Gilles, Corky, Will and Chas Collins. Perhaps somebody can have a guess where this was taken, the beach at Nigg perhaps? Hi Gordon, hard to say where, Nigg would be a good guess but I don't recognise the surroundings and it looks too steep. Of course I knew all of them well except Gilles. Did he live on Outram Street close to King Street? I wonder if Charlie remembers the havoc he caused in room 15 so long ago, I do. Hi Harry, Robert Gillies lived on Outram Street, next door to the Masonic Hall, and the family later moved to Saltburn. He served his time as a mechanic in Taylors Garage, but the last I remember him as a postman in Dingwall in the 1960s. Hi Gordon, I was speaking to Charlie on Saturday and he informs me that the picture was taken at Hopeman beach. Definitely Hopeman beach (located between Burghead and Lossiemouth). That is Hopeman Lodge at the top left of the photograph. Good photos of all the lads regardless where it was taken. Really nice to see it. They are just as I remember them.......a FEW years ago!! I think this must be about 1953 or 1954. It was about this time that I joined the Scouts and they went to Hopeman that year for the annual camp. 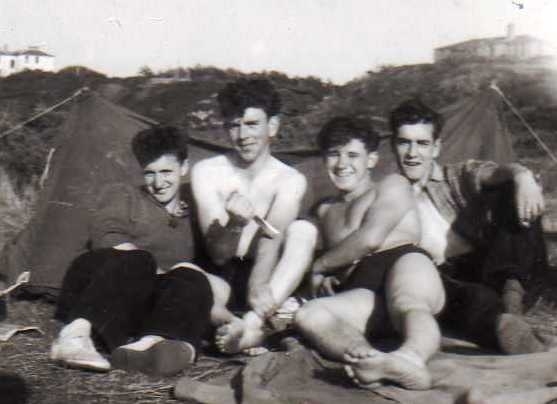 I was too young for this one but the following year I went to Granton-on-Spey camp and in 1956(?) to Troon. The trip to these camps was made in the back of a covered lorry, piled up with all the tents, cooking pots (dixies) etc. Bill, don't know if this was a scout camp, I never remember Rob Gillies, or Corky in the Scouts. I got the 1956 from the rear of the photo. You are probably right Gordon! I don't remember them in the Scouts either. It was only a guess. Hopeman is not exactly centre of the holiday world and I thought maybe I had the answer to the mystery. On the other hand why should they not decide to go there because they had heard it was nice!